Russia is ahead of the U.S. and most BRICS countries in the Energy Architecture Performance Index. Norway, Sweden, and France are at the top of the rankings, while Ethiopia, Tanzania, and Lebanon come in last on the list. The World Economic Forum (WEF) recently partnered with Accenture to present a report examining the factors for effective global transition to new energy architecture for 105 countries. The demands of each country’s energy architecture, including economic growth and development, environmental sustainability, and energy access and security, formed the crux of the index. Norway, Sweden, France, Switzerland, New Zealand, Colombia, Latvia, Denmark, Spain, and the United Kingdom topped the rankings, while Ethiopia, Tanzania, Lebanon, Mozambique, Nepal, Mongolia, and Bahrain fared the worst. Russia ranked 27th, above most other BRICS countries (except Brazil, which ranked 21st): South Africa (59th), India (62nd), and China (74th). The United States (55th) also ranked below Russia, with most OPEC countries ranking closer to the bottom of the list: for instance, Saudi Arabia (82nd) and Iran (96th). Russia was able to score better than other economies that heavily export natural resources, thanks to its high electrification rate, independence from energy imports, high-value fuel exports, and a developed nuclear energy industry, the WEF report said. Weaknesses include low energy efficiency of GDP and poor emission regulations. Russia’s energy mix also has a low share of coal and fuel oil, Nomos Bank analyst Denis Borisov added. Fast-growing, industrial countries, as well as resource-rich ones, find it harder to perform well on sustainability and security indicators and generally rely on subsidised fuels to meet demand, the report said. Energy subsidies rose 30 percent to $523 billion in 2011, according to the International Energy Agency (IEA). Subsidies distort pricing, the WEF added.Saudi Arabia’s domestic oil price, for example, is just $10. Worldwide renewable energy investment totalled $88 billion in 2011, versus $523 billion in subsidies spent on fossil fuels, the IEA noted. Russia’s domestic natural gas prices are capped by tariffs, just as their oil prices are capped by export duties, explained Borisov. Energy contributes 30 percent to the economy in Nigeria, 35 percent in Venezuela, and 57 percent in Kuwait, versus 4 percent in the United States. 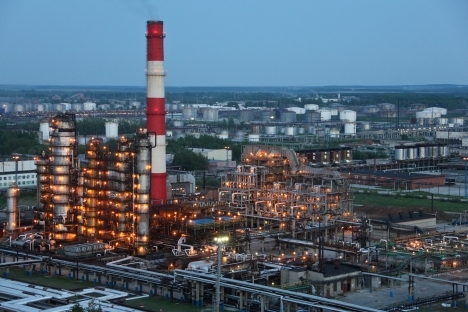 According to Rosstat, extraction of all mineral resources accounted for 9 percent of Russia’s GDP in 2011. The IEA predicts that the share of energy in the GDP will change: The United States will become the biggest oil producer by 2020; China promises to reduce its share of energy consumption in the GDP by 16 percent by 2015; the EU plans to reduce demand for energy by 20 percent by 2020; and Japan is looking to cut electricity consumption by 10 percent by 2030.